Burial places for the dead come in a variety of forms. One ancient form is the catacomb, an underground city of the dead consisting of galleries or passages with side recesses for tombs. A related form is the ossuary, a Native American communal burial place or a depository (a vault, room, or urn) for the bones of the dead. Catacombs originated in the Middle East approximately 6,000 years ago. These earliest examples were often secondary burials where the bones of the dead were placed in ossuary containers. Initially, the dead were buried within settlements, but with the progressive urbanization of the ensuing millennia, burials moved outside of the towns. From 3300 to 2300 B.C.E. , several generations of one family were typically buried in a single cave, whether natural or artificial. Pastoral nomads also used caves that were entered through a vertical shaft. Multiple interments in caves continued over succeeding millennia, together with other forms of burial. There is evidence of the use of long subterranean channels and spacious chambers by about 1500 B.C.E. By the time of the Assyrian and Babylonian conquests of Israel and Judah, some burial caves were quite large and elaborate. After the Roman conquest of Palestine, many Jews settled in Rome and adapted the burial customs of the Middle East to their new environment. In contrast to the Roman practice of cremation, the Jews buried their dead in catacombs they created for this purpose. Jewish catacombs can be recognized by inscriptions of the menorah, the seven-branched candlestick, on gravestones and lamps. Used only for burials, they are not as elaborate as the later multipurpose Christian catacombs. Early Christians were regarded as a Jewish sect, and their dead were buried in catacombs modeled on those of the Jews. Early Christian martyrs buried in the catacombs became objects of veneration, so that the wish for burial near these martyrs ensured the continued use of the catacombs until the early fifth century C.E., when the Goths invaded. In the eighth and ninth centuries the remains of the martyrs were moved to churches, and the catacombs fell into disuse; by the twelfth century they were forgotten. Since their rediscovery in 1578, they have been the object of constant excavation, exploration, and research. Although the Roman catacombs are the best known, others have been found throughout Italy (in Naples, Chiusi, and Syracuse), in North Africa (in Alexandria and Susa), and in Asia Minor. 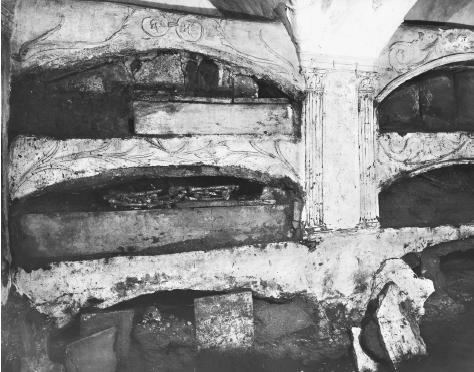 Loculi, shelves for remains, can be seen in the ancient catacombs of St. Sebastian in Rome. the catacombs served not only as tombs but also for memorial services. A first level of the catacombs is from thirty-three to forty-nine feet below the surface, with galleries ten to thirteen feet high; sometimes there are three or even four levels. Niches for the bodies line the passages. The walls and ceilings, made of plaster, are generally painted in the fresco manner— with watercolors before the plaster is dry. From about the fourth century C.E., shafts were dug from the galleries to the surface to provide light and air. The inscriptions reflect the changing values of society. As conversions to Christianity became more common, nobler names appeared more frequently. With the gradual decline of slavery, there were fewer distinctions noted between slaves and freed men. Catacombs, primarily a curiosity and tourist attraction in the twenty- and twenty-first centuries, are sparsely written about in fiction. However, one example by Arthur Conan Doyle, the creator of Sherlock Holmes, is "The New Catacomb," a story of two young colleagues, one extremely shy, the other a womanizer, both noted experts on catacombs. The womanizer has enticed a young woman away from an unknown fiancé, then abandoned her. The shy one tells the other of a new catacomb he has discovered, which will make him famous, and offers to show it to him. Deep in the labyrinth he leaves his colleague to die in the dark, informing him that it was his own fiancé who had been abandoned. Avigad, Machman. "Beth Shearim." Encyclopedia Judaica Yearbook. Jerusalem: Keter Publishing House, 1972. Doyle, Arthur Conan. "The New Catacomb." In Tales of Terror and Mystery, Harmondsworth: Penguin, 1979. Mazar, Amihai. Archaeology of the Land of the Bible: 10,000–586 B.C.E. New York: Doubleday, 1990. Murphy, F. X. "Catacombs." New Catholic Encyclopedia, Vol. 3. New York: McGraw-Hill, 1967. Rabello, Alfredo Mordechai. "Catacombs." Encyclopedia Judaica Yearbook. Jerusalem: Keter Publishing House, 1972.